Demi Mitchell took her love for songwriting from the town of Maitland she grew up in to the steel city of Newcastle. Her music explores the essence of the city, the eclectic mix of working class attitudes that hangover from a time gone-by and the now thriving music and arts scene that seems to breed a particular kind of take no prisoners individual. Her new record ‘The Overflow’ is a culmination of dark and dreamy melodies, psychedelic-folk and introspective lyricism best drunk in as a passenger on your next highway drive. Recorded in Melbourne with Roger Bergodaz at Union St Studios, Demi’s sultry smoky-voiced musings are like a valium daze that hark back to the untamed sounds of PJ Harvey, the aching melancholy of Karen Dalton and the soulful grooves of JJ Cale. Medicine Woman is the first single from 'The Overflow' recorded in Melbourne with Roger Bergodaz at Union St Studio. 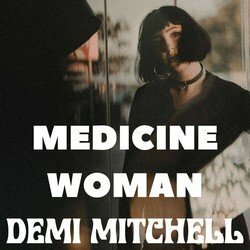 Demi says of summer psychedelic-folk track: “Medicine Woman is about how making yourself vulnerable to someone can be both an empowering and daunting experience and finding the balance between the two."